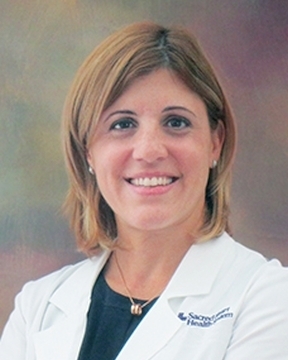 Dr. Maria Toledo earned her medical degree at the University of Puerto Rico and completed her residency training in neurosurgery at the Puerto Rico School of Medicine. Following her residency, she completed a two-year fellowship in endovascular neurosurgery. Dr. Toledo then completed a second fellowship ... Read More in cerebrovascular and skull base neurosurgery in the Barrow Neurological Institute in Phoenix, Arizona, under the tutelage of the world-renowned neurosurgeon Dr. Robert Spetzler. Before joining Sacred Heart Hospital, Dr. Toledo was the director of the Endovascular and Cerebrovascular Program, co-founder of the Stroke Center and director of the Advanced Neuroscience Center in Puerto Rico. Dr. Toledo has special medical interests in treating cerebral and spinal vascular lesions- either endovascularly (with small catheters inserted through the groin) or through a craniotomy (opening the skull) Vascular lesions include brain aneurysms, arteriovenous malformations,arteriovenous fistulas, and ischemic strokes. Dr. Toledo is capable of embolizing head, spinal and neck tumors in preparation for surgery. She also has significant experience treating pituitary tumors, hemifacial spasm, trigeminal neuralgia, meningiomas and other brain tumors. Dr. Toledo has extensive experience in performing cerebral diagnostic angiograms to diagnose and plan treatment for suspected vascular lesions. In her spare time, Dr. Toledo enjoys spending time with her family, practicing yoga, paddle boarding, snorkeling, hiking, and skiing.